Last Friday, my daughter’s school was hosting an Australia’s Biggest Morning Tea fundraiser. Newsletters were sent out asking parents for donations to a cupcake stall that the students could buy from during recess to raise money for cancer research. Of course I wanted to donate something; not only would I be donating to a worthy cause, it would give me a reason to bake cupcakes! I knew these cupcakes would specifically be for children, so I wanted to make something very cute and child-friendly. 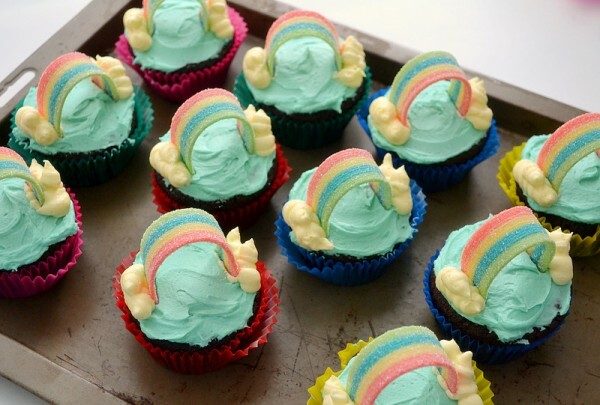 Rainbow cupcakes would be perfect! I don’t mean those cakes that are packed full of food coloring to create some psychedelic rainbow-like patterns, as I’m not a huge fan of those. No, what I mean is…. A real rainbow cupcake! This is a classic chocolate cake and vanilla buttercream combo. I used my favorite chocolate cupcake recipe, which happens to be vegan, and is chocolaty, moist and fluffy. The vanilla buttercream was, of course, tinted with a touch of food coloring (except for the clouds). The rainbow part is a sour fruit rainbow strap. The process to create this cute look is super easy, you don’t even need to have any knowledge of cake decorating. 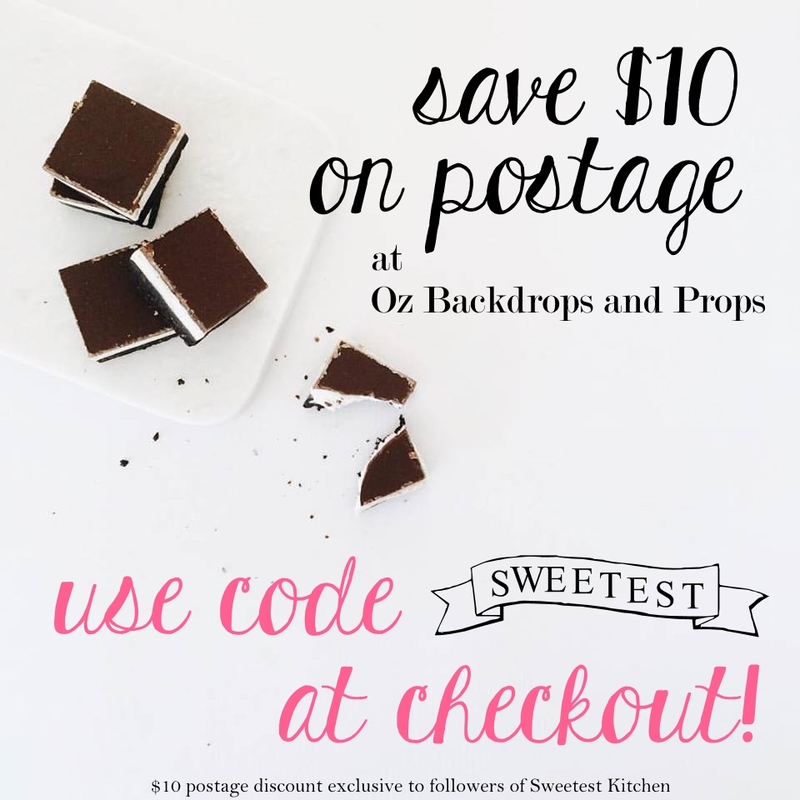 In fact, you don’t even need to bake cupcakes from scratch – use a boxed mix if you prefer. While you’re at it, you can even use a tub of pre-made frosting. The only things you’ll need extra are blue food coloring, a small piping bag or Ziploc bag, and rainbow fruit staps. The recipes for the chocolate cupcakes and vanilla buttercream can be found by clicking on the respective links, which will take you to previous posts from my blog – the recipes will make 12 cupcakes. For instructions on putting together the rainbow cupcakes, keep reading! Now really, the process of putting these cupcakes together is pretty self-explanatory. After making the frosting, take out about 1/3 cup of it; this will form the clouds. Set it aside. For the rest of the frosting, drop in a few drops of blue food coloring and mix really well. The color you end up with entirely depends on you – if you’re after pastel, only add a few drops; if you want a dark blue sky, add more drops. Take the blue frosting and spread it on top of the cooled cupcakes. Spoon the remaining white frosting into a pastry bag or Ziploc bag, snip off a small part of the tip or corner (or use a small-ish pastry tip), then pipe out a cloud-like wisp of frosting on either side of the cupcake. Finally, take the rainbow straps and chop them in half if they are longer straps, bend into a rainbow shape, line up the ends of the rainbow with the clouds and firmly, but gently, push the ends down into the blue frosting. Easy! When I came back to school that day to collect my daughter and bring her home, the ladies told me that my cupcakes were the first to sell out! Hooray! I hope my little donation will help with the fundraiser. 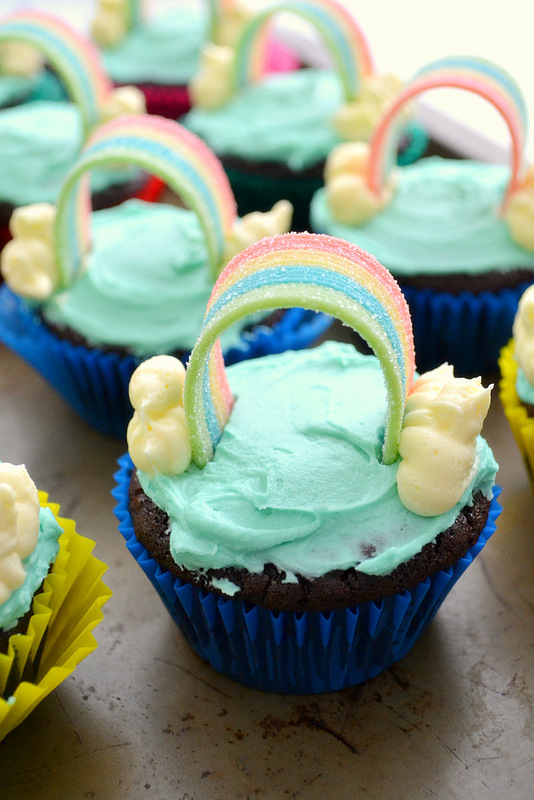 If you’re after ideas for something to do on a rainy day or a super easy last-minute idea for a child’s birthday party, I totally recommend trying out these rainbow cupcakes. They are sure to be a huge hit with the kids! Love these! So cute and creative, really brightened my evening!